Many annuals, perennials and wildflowers that grace our gardens also exist to feed the birds. Some produce seeds, some produce nectar and some have the added benefit of attracting butterflies, too. As you improve and diversify your own bird-friendly backyard, you help an environment that is being decimated by population growth and urban development. Planting to attract birds isn’t difficult, and the rewards can be enormous. Watching the birds up close, you learn about their amazing interactions with native plants you’ve provided. And you discover more about the birds’ needs for breeding and feeding, space required for territories, what’s necessary for nesting and for stopovers during migration. 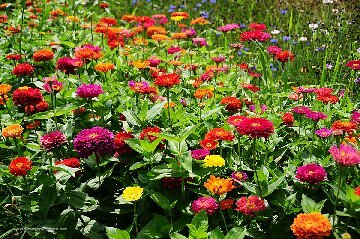 Annual flowers are prolific seed producers, with the added benefit of almost-instant color to brighten your view. Try easy-to-grow bird-favorites such as cosmos, impatiens, marigold and zinnia. A single zinnia seed head can keep a goldfinch busy for some time cracking open one seed per petal. 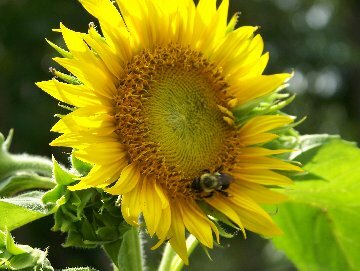 The all-time favorite, sunflower, comes in varieties from small accent plants to the very tall sunflower with the large flowering head. Locate them so the sunflower head can follow the sun. As the plant matures, cut and dry the seed head for winter feeding to the chickadees, nuthatches and small clinging birds. Some perennials that you add to your flower borders will do more than produce abundant seeds. Some grow thick stems or reach shrub size that make nesting sites for birds. Nectar rich perennial flowers and vines favored by hummingbirds include penstemon, bee balm, trumpet vine, columbine and fuchsias. A small, simple herb garden, attractive to butterflies, bees and hummingbirds, might include fennel, dill, marjoram or basil among others. Add zest to your culinary efforts while you help winged visitors in your garden. Wildflowers that attract birds with their seeds can be incorporated successfully along with cultivated species, if you are patient and persistent. Start small; some species require several seasons to mature. Birds in the garden bring color, song, motion and beauty, plus a voracious appetite for insects. Reduce the use of pesticides, which can be harmful to wildlife, including the insects that birds eat so heartily. Chemical sprays won’t be as necessary with your feathered friends flying around constantly looking for dinner on the wing—–and on the ground!